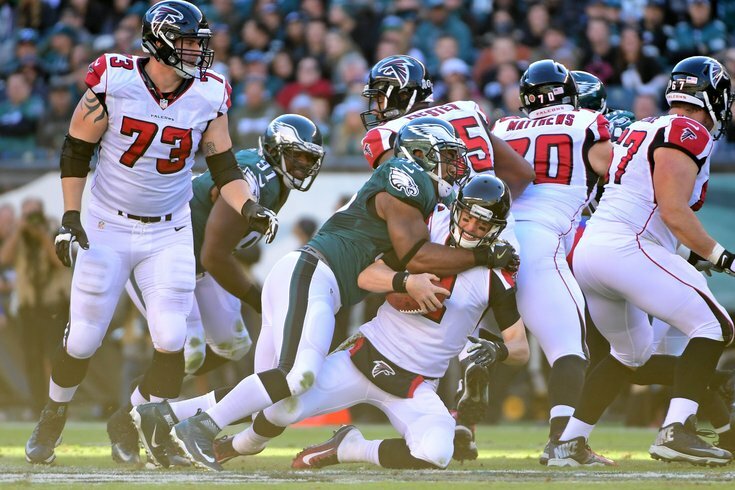 Philadelphia Eagles defensive end Brandon Graham (55) sacks Atlanta Falcons quarterback Matt Ryan (2) during last season's matchup at the Linc. The Eagles may have caught somewhat of a lucky break on Saturday night when the Atlanta Falcons upset the Los Angeles Rams in the first NFC wild-card game of the weekend. The 26-13 win for the reigning Super Bowl runner-ups guaranteed them a date with Birds in the divisional round next weekend at the Linc. And that's just what fans were hoping for. In our totally unscientific survey, 54 percent of voters believed the Falcons would be the best matchup for the Eagles – 35 percent wanted them to play the Panthers and just 11 percent wanted to see them face the Saints. That largely corresponded to what Vegas oddsmakers were saying last week when they revealed that the Birds would be underdogs against the Saints and Panthers, but would be a pick-em against Atlanta. But after Matt Ryan and the Falcons stunned the No. 3-seeded Rams in their opener, Vegas is slightly higher on Atlanta then they were last week. Currently, they have Atlanta listed as a road favorite against the Eagles. It's not often you see a No. 1 seed like the Eagles head into their first playoff game as an underdog. But, after losing Carson Wentz in Week 14 and seeing their stock plummet, here we are. While it's happened before, it's still rare to see top seeds as underdogs of any kind in the divisional round. Furthermore, it's never happened in a game featuring a conference's No. 1 team facing a sixth-seeded team. Falcons have opened as 2.5 point favorite over Philadelphia. First time a 6 seed ever has been favored over a 1 seed. And, at least early on, it's trending in the wrong direction for the Eagles. Atlanta being such a heavy road favorite – don't forget the home team usually gets about three points right off the top due to that advantage – isn't due to just one or two oddsmakers overreacting to a big Falcons win. It's nearly unanimous across the board. And what the hell was going on from 2005-2010?